The tranquil village of Argiroupolis is a remarkable area of special historic interest and the whole surrounding area is outstanding. The mountain village, is situated at the once important ancient Greece-Roman city of Lappa, is close to Georgioupolis beach and Kournas Lake. The rivers Petre and Mousella flow on either side of the village. Albeit, the fact that most of its precious finds are now in the Archaeological museums of Rethimnon and Heraklion should not put you off exploring this beautiful village. 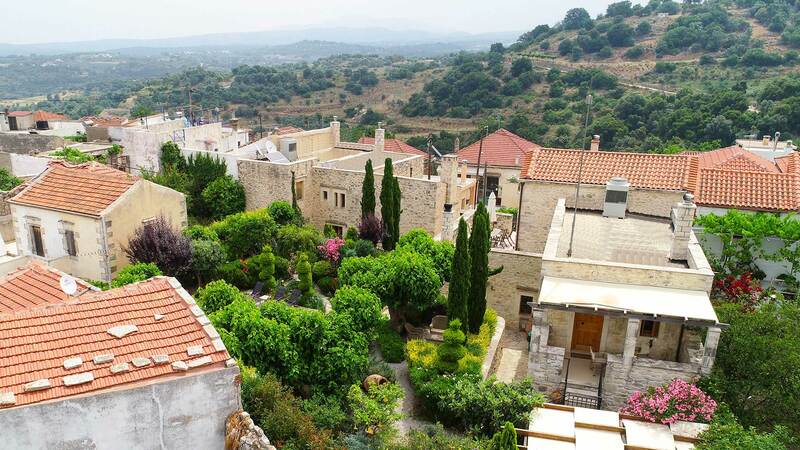 This is one of most attractive villages of the whole area and the first stop must be at the square and the 17th century Venetian church of Ayios loannis (Saint John). The name Lappa was well known from the 4th century B.C. Around 220 A.D. The village prospered and developed to become one of the most important towns of western Crete and was thriving during the Roman era. It controlled the area around it from the North to the South coast. The reason for it destruction is not known, whether by enemies, possibly an earthquake or other theories are some form of epidemic. Lappa most certainly had two big harbors’ “Ydramia”, on the Cretan Sea, where now stands today’s village of Dramia and Kavros on the northern coast, and the other at “Pheonix” on the Libyan Sea, possibly where Loutro is today. In the second Byzantine era the city was destroyed by the Arabs in 828 A.D. A new town was built on the old site and Lappa was lost, with the new town becoming known in the Middle Ages as “Stimpolis” (in the city). It was taken by storm and almost entirely destroyed by the Romans in 67 B.C. The emperor Octavian Augustus restored it and, in consideration of the aid rendered to him in his struggle with Mark Anthony, he bestowed on the citizens their freedom, and with it the right of coinage and a water reservoir in 27 B.C. which still supplies the village today. Following this, the town was given many other names. The Turks called it “Gaidoropoli” (Donkey town) or “Samaropoli” (Saddle town). With its new name Argiroupolis taken in 1822 possibly after “argyro” (silver) as was mined in the area. Silver and copper coins were made and they had representations of Poseidon on them. According to the myths, Lappa was created by Agamemnon, the hero of the Trojan War. The older coins of the city show the goddess “Britomartis Artemis”, a Cretan goddess influenced by the Minoan religion. In the Greek wars they were allies of “Knossos” but when the armies of Knossos destroyed “Lyttos” the people of Lappa accepted the Lyttoans into their city and welcomed them into their homes. Many of today’s buildings and churches have been constructed using stones and other building materials from the ancient city and the more recent Venetian buildings. All of which can be seen around the narrow streets of this lovely village. Including Roman baths, part of a Venetian villa, a Roman Gate, Ionian columns. A village folk museum assembled by the Zografakis family who lived in Argiroupolis. The collection includes tapestries, farm implements, photographs and so much more. An elegant Venetian dwelling remains with a portal bearing the legend, “Omnia Mundi Fumus et Umbra” (all things in the world are smoke and shadow). The tale is about a beautiful Venetian Princess called Sofia, daughter of the local feudal Lord Francesco da Molin. She was engaged to marry Petros, the son of a Cretan rebel named Yeorgios (George) Kantanoleon. The wedding took place at the initiative of the Kantanoleon family and was intended to reconcile the two enemy sides. But Francesco da Molin considered this to an ideal opportunity to get rid of his opposition for all. During the great feast that followed the wedding, he made sure that Kantonoleaon and his tree hundred men were so drunk that they fell asleep. He gave then gave a sign for two thousand men of his army forces to unexpectedly capture the rebels and during the next few days they hung them all in the streets, as a warning and threat to the local not to retaliate. After the incident the Cretan learned their lesson well. “If you want to be a rebel, better forget about marriages and stay in hiding in the forests”. On one of the stones which was on the main entrance lintel of the da Molin fortress, the moral of the story was engraved. 500 meters at the rear back of the church in the village square is an old working closed cistern dated 27 B.C. Its water capacity is more than 1000 cubic meters. A large mosaic floor was unearthed 20 years ago dated from Roman times. Some of the manor houses are still in good condition. Stone portals and historic ruins give a character to this unique village which has 32 churches and chapels. Just out of the village off the main road, there is a site known as the “Five Virgins” with a small cave church. This is the ancient Necropolis and has many tombs that you can visit as an open museum. The chapel takes its name from five young women put to death by the Romans in the 3rd century for secretly practicing Christianity. On the First Saturday after Orthodox Easter the local farmers bring their lambs to be blessed, the sheep are then milked and this is then boiled and drank by the congregation. You must walk behind the chapel to get the best views of more tombs. Below the tombs, further along the ancient walkway, you can find a huge plane, tree said to be over 2000 years old. This magnificent tree was split into two, by a thunder strike, enabling you to walk right through it. You can approach this by following the signpost to a narrow road to the village of “Kato Poros” just before Argiroupolis coming up from the village of Episkopi. Below the village is an idyllic area, even on scorching summer days it is in the shade of the evergreens and is always refreshing – sign posted the springs of Argiroupolis. As the name suggests, the whole area is rich in water gushing spring water tumbles over rocks and stone everywhere in this fertile area with many plane and walnut trees. The traditional taverns, invite you for a meal in the shade of the trees and waterfalls. However, it is especially busy on Sundays and local holidays. So a visit during the week is advisable so get a better chance not to miss anything. “Ayia Dynami” (Holly Power) cave church is the spring of this enormous quantity of water that runs freely everywhere. These springs are supply the drinking water of Rethymnon city. For many years there was a carpet laundry on this spot with mills that used to make the famous Greek rugs “Flokati” and its ruins still remain. Vegetation is abundant in this fertile environment. Around the taverns at night the whole scene is quite magical with lights illuminating the shrubbery. If you wish you can continue on to Asi Gonia further up the Gipari gorge and then return back from the old road to Kournas Lake and Georgioupolis or take an alternative route via Episkopi.